I am trying to get my son, who is going on two years old, into the music that I love - the great standards. So far, he shows some promise! Anyways, last night he picked a CD from my collection to listen to. 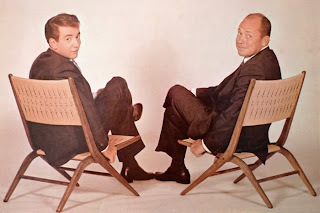 It was a great duet album - Bobby Darin and Johnny Mercer: Two Of A Kind! Two of the all-time giants of American popular music come together in this delightful album originally released in the early sixties on Atlantic. 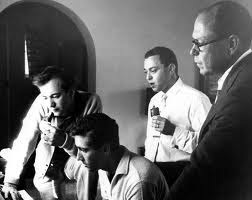 According to the liner notes, written by Stanley Green, it was Bobby Darin's idea to undertake this project, and Mercer "was excited about the idea right from the start." Listening to the finished product, there is no doubt about that. The two are really enjoying themselves in the studio, which means that we, as listeners, are allowed to share in the fun. Johnny Mercer, who was one of the few songwriters who could sing, was in fine voice on this record. I personally think it was one of his best singing efforts. As Green notes, there are hardly any standards in the album: "For this recital, both men decided that though the accent would be on the old-timers, the all-too-familiar warhorses would be kept carefully locked up in the stable." Thus, Darin and Mercer go through a great selection of old tunes, from "Indiana" to "East of the Rockies" to "Jellyroll," all delivered with a casualness that makes them irresistible. They also unearth a couple of obscure gems like "My Cutie's Due at Two to Two," "Paddlin' Madelin' Home," or "Caretaker's Daughter," and they even have time to throw in a classic written by Harry Barris and originally performed by Bing Crosby with the Rhythm Boys, "Mississippi Mud." 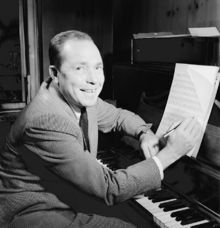 Some of Johnny Mercer's own compositions are also highlighted in this project, proving once more (as though it were really necessary!) that he is one of the most gifted, poetic songwriters of all time. For instance, "If I Had My 'Druthers" is given an enjoyable, laid-back treatment, while the reading of "Bob White" is among the best ever committed to wax. Lobosco, I love Bobby Darin and Johnny Mercer. This has to be a winner. I don't think I've ever actually heard this album. I do know Jellyroll and Mississippi Mud, and would like to hear Mercer and Darin's version. Nice work! The whole album is great. Let me know if you want me to burn you a copy. Shoot me an email at: dlobo74@gmail.com.